What Is the Difference Between Brewer's Yeast & Baker's Yeast? Two among many different types of yeast, brewer's yeast and baker's yeast both turn sugars into alcohol and carbon dioxide. Both of these yeasts are made from strains of the Saccharomyces cerevisiae fungus, but each from different strains of this species. Brewer's yeast and baker's yeast differ in their composition, uses and health factors. Different strains of Saccharomyces cerevisiae produce different proportions of carbon dioxide and alcohol. Baker's yeast is a blend of several strains of Saccharomyces cerevisiae chosen for their flavor and ability to make carbon dioxide, which causes bread to rise. Brewer's yeast is made of strains chosen for their alcohol-producing ability and tends to have a bitter flavor. Brewer's yeast is considered an inactive yeast while baker's yeast is an active yeast. In an active yeast the yeast cells are still alive, whereas they are killed in the process of making inactive yeasts, like brewer's yeast. Brewer's yeast is used to brew homemade wines and beers, while baker's yeast makes bread rise. You can't brew alcohol with baker's yeast and you can't leaven bread with brewer's yeast. Historically, brewer's yeast has also been used to treat burns, diabetes, diarrhea, eczema, nervous disorders, lower cholesterol, increase energy and immune functioning, relieve stress, detoxify skin, reduce wrinkles and heal wounds. There is, however, no scientific evidence supporting these uses. Anecdotally, pet owners may sprinkle brewer's yeast into their pet's food to ward off fleas and ticks. While brewing alcohol is its primary purpose, brewer's yeast is also frequently used as a nutritional supplement, although it should not be confused with nutritional yeast. Used this way, brewer's yeast provides B-complex vitamins as well as many valuable minerals, including calcium, potassium, iron and selenium. It is also one of the richest sources of chromium, which baker's yeast does not contain, and has all of the essential amino acids, which comprise about half its weight. Neither brewer's yeast nor baker's yeast is the same as the Candida albicans yeast that causes infection. Some reports of yeast infection not related to Candida have been reported from brewer's yeast, however. Baker's yeast, by contrast, is not known to cause infection, although it can exacerbate existing infections. 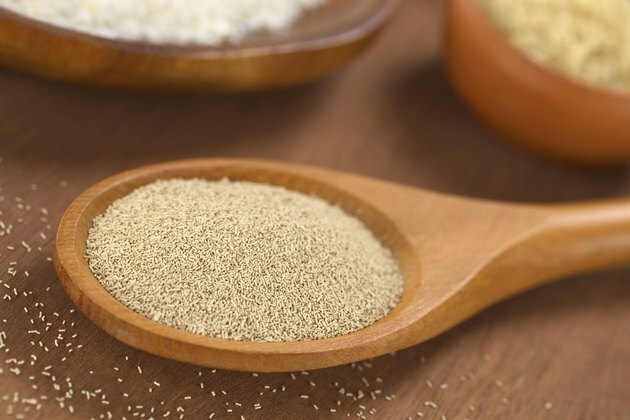 Baker's yeast should never be taken as a nutritional supplement or food source, as it can actually deprive your body of B vitamins as it continues growing in your intestines. Brewer's yeast can alter the beneficial bacteria in the large intestines while baker's yeast will not.